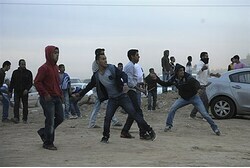 Leaders of the extremist Islamic Movement in Israel have claimed that Muslim MKs and other communal leaders took part in Saturday’s “Day of Rage” against the Prawer plan, which resettles Bedouin squatters to legal territories in the Negev. The movement failed to specify which Knesset members were involved with the movement. The Islamic movement in the Negev, which is led by regional Sheikh Mousa Abu Iyada, opposes the sale of land owned by Muslims to Israelis and non-Muslims under restrictions they claim are imposed by Sharia law. The movement also claimed in a December 2011 demonstration that the entire Negev is “Waqf,” or sacred to Islam, and that Muslims are forbidden from “giving it up” to its legal Israeli owners under any circumstances. This is not the first time the movement has supported demonstrations against Israeli Jews. Last year, the group organized protests in the central Israeli city of Lod against the budding Orthodox Jewish community there, claiming it was a “Jewish takeover” of the traditionally Arab-majority city. Last month, the movement’s deputy leader Sheikh Kamal al-Hatib also threatened to take drastic measures if the Temple Mount was opened to equal rights for visitation, religious ritual, and prayer for Jewish groups. The Temple Mount is Judaism’s holiest site, but following pressure from hardline Islamic groups the Israeli government continues to enforce harsh restrictions against Jews who wish to visit the Mount, including a total ban on Jewish prayer. Palestinian Authority-based news agency Maan reported Tuesday that Israeli military vehicles crossed into northern Gaza for surveillance activities on Monday.